If it feels like a long time since we’ve gone on an adventure with Captain America, you’re right. Captain America: The First Avenger mostly took place in 1942, putting it first in chronological order. That means I watched it way back when I started this journey. After an appearance in The Avengers, he’s back at the helm of his own film. This also just so happens to be one of the Marvel Cinematic Universe films I’ve seen more than any other. Captain America: The Winter Soldier sees Steve Rogers trying to cope with life in a whole new era. That’s evident in the opening scene, where we see him write down a list of things he needs to check out to get with the times. It’s a funny little list that sheds light on his character. This scene also introduces Sam Wilson, better known as Falcon. He’s not one of the more interesting heroes, but he works in the MCU for one reason. Anthony Mackie and Chris Evans have great chemistry and play well off each other. It has made Falcon a fun addition to any movie, especially in his debut here. Speaking of the supporting cast, Natasha Romanoff/Black Widow is front and center right next to Cap. So much so, that this is almost a tandem movie. Everyone who knows about the MCU knows her upcoming romantic storyline with Bruce Banner. However, Scarlett Johansson oozes chemistry with Evans. They flirt a ton in this movie and a romantic storyline with Cap would've felt more natural. More than that, the things they go through in this movie builds a lot of trust among them that plays a major role in their futures in this universe. This is honestly the best Widow has ever been. Great scenes and about as strong as we get from her in terms of character development. 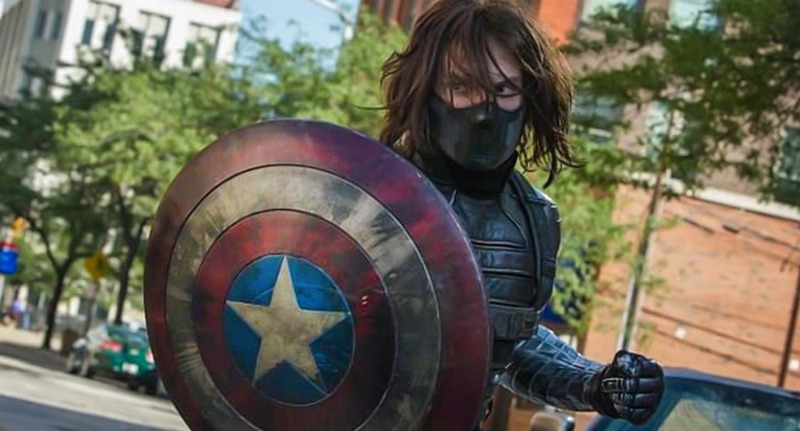 Sticking with the movie’s character work, we have to talk about the Winter Soldier himself, Bucky Barnes. Bucky was believed to be dead after a poor CGI fall from a train in Captain America: The First Avenger. He turns out to be the Winter Soldier, battling our heroes throughout. We find out he was brainwashed and the fact that Cap is willing to do whatever it takes to get his friend goes a long way in showcasing who he is and what the relationship with Bucky means to him. Without this storyline, Cap may end up feeling like a cookie cutter hero. This whole thing establishes so much about him. That being said, this relationship would’ve meant even more if one thing didn’t happen in this film. Cap spends time at the bedside of a dementia ridden Peggy Carter. First of all, the effects on Hayley Atwell’s face to age her looked way off. More importantly though, I think this kind of dampens the ending to the first film and takes a bit away from what Bucky means to Cap. If you think about it, the idea that everyone Cap knew from his regular life is gone would make the appearance of Bucky mean even more. With Peggy still around, albeit an older Peggy, I think it kind of lessens the Bucky impact. Other than Peggy, I’d say I have one or two minor gripes. First, there’s an early fight scene where Captain America battles a villain played by MMA fighter Georges St-Pierre. It’s not a bad fight, but it feels kind of cheesy and overly choreographed. Like, they seemed to be trying too hard to have a martial arts style fight rather than one that felt realistic. There’s also some issues surrounding Nick Fury. His death ultimately gets faked in the movie and it was just hard to buy. It never felt like they would truly kill him off and seemed too similar to what was done with Commissioner Gordon in The Dark Knight. Though I wasn’t big on the fight on the ship, there is a certain fight that stands out in this movie. 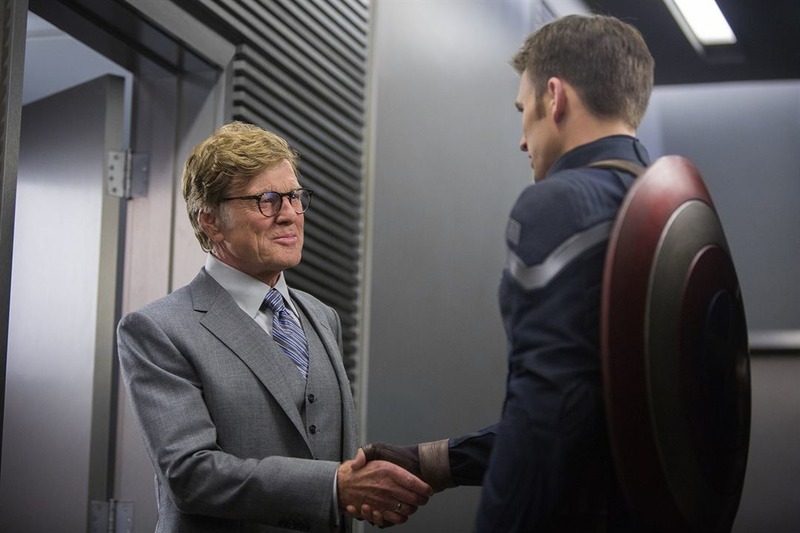 At one point, Cap is in an elevator at S.H.I.E.L.D. headquarters. A bunch of dudes crowd him in the tiny space and he can tell something is up. His line of, “Before we get started, does anyone want to get out?” is phenomenal. The ensuing fight is exciting, innovative, and one of the coolest things ever done in any MCU film or television show. Finding out Bucky is still alive is a huge deal, but there's an even bigger revelation in this movie. It informs us that Hydra is not only still active, but they’ve infiltrated S.H.I.E.L.D. for decades. That included Jasper Sitwell, who we’ve seen in The Consultant, Agents of S.H.I.E.L.D., and Item 47, to name a few. He was a relevant enough character for the turn to impact us, but not big enough that it turned our world upside down. The conspiracy within S.H.I.E.L.D. made this into a political thriller more than a superhero movie. Special kudos needs to go to Robert Redford, who was stellar as the corrupt Alexander Pierce. Speaking of Sitwell, the scene where he’s interrogated by Cap, Widow, and Falcon gives us some intriguing MCU connections. He talks about an algorithm that informs them of potential threats. When he does this, he mentions Bruce Banner and Stephen Strange. We’ve obviously seen Banner already, but this let us know that Dr. Strange was at least in the works. The Hydra stuff also has major effects going forward, especially in Agents of S.H.I.E.L.D. Lastly, this entire movie goes a long way in setting up what Cap goes through in the final piece of his trilogy. Things are happening that he doesn’t trust and he has every reason to feel that way. The combination of this movie and Avengers: Age of Ultron, sets up the final piece of the Cap trilogy masterfully. Currently, The Avengers sits at the top of the MCU in terms of quality for me. This is right up there with it. The Russo brothers stepped in and helmed the best non-Avengers movie in this universe to this point. The pacing was great, it had fantastic plot twists, the acting was strong, and the action mostly worked. An incredible film in every single way. These five classic movie comedies are a laugh a minute even for modern audiences. Mill Valley Film Festival spotlights Paul Dano and his directorial debut, 'Wildlife'.